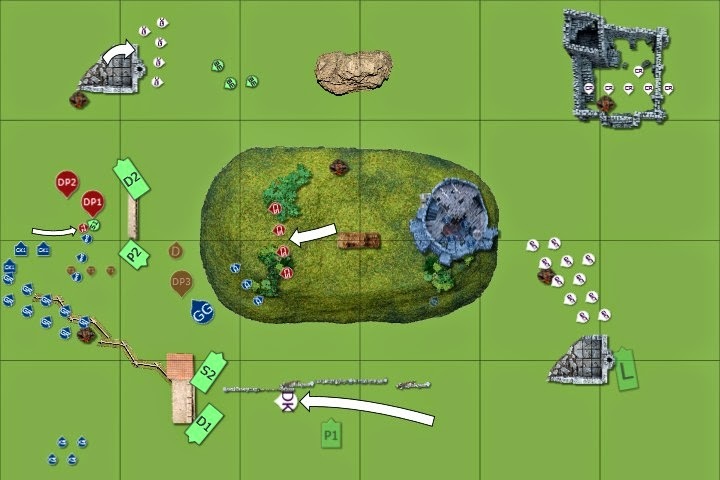 Sadly, I do not get to play very often, but this weekend I made the 1 hour trip to play a 2v2 game. My ally brought a Kroot list based on the original Kroot Mercenary list, updated for 6th edition. This guy is known as the "Nid Kid", he loves all hordes and plays Nids, Orks and Kroot. I play a Mech Tau list with no kroot, so it worked out well fluffwise. Both sides had two armies of 1500 points each. 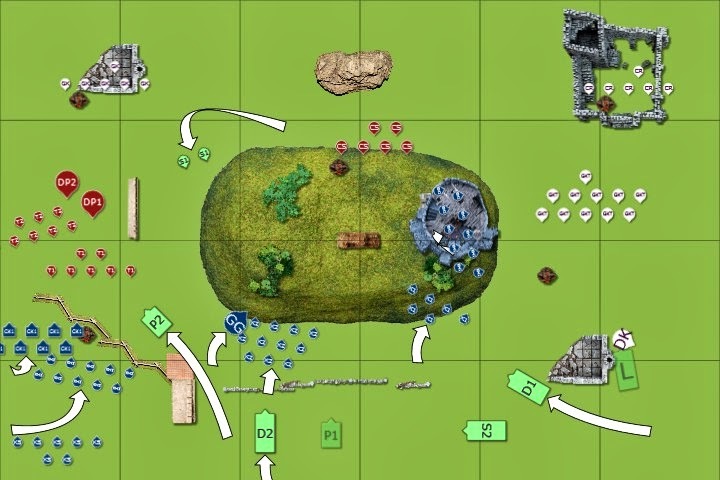 This game was only my second 6th edition game ever (the first was a 500 point skirmish). Also, my first doubles game, first game against Grey Knights and first game against the new Dark Angels. 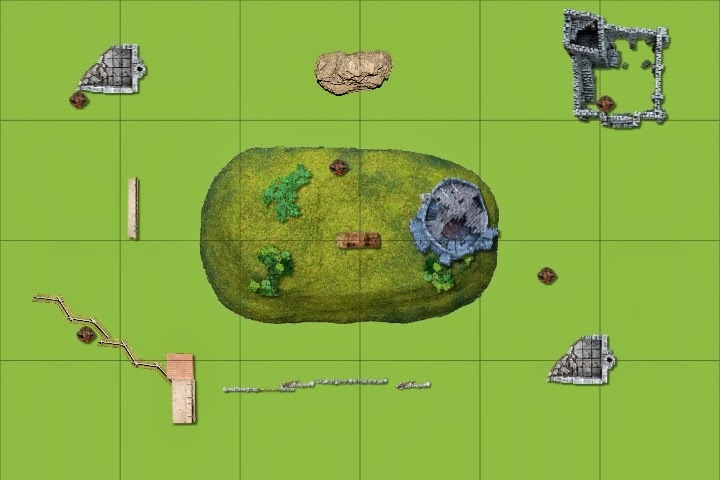 My first time using Battle Chronicler as well, so please overlook the errors in the pictures and use them more like a general picture of how the game developed. BC is tougher to use than Vassal but I prefer how it looks. Beware! This is a pretty long report. He took an orkish trait so his whole army was Toughness 4. It all had infiltrate so he scouted half of his units and hid one unit (like the special Genestealers) within the area terrain at the center of the board. His force had almost no way of dealing with Armour aside from melta bombs and some rending eviscerators (or something similar). Thankfully, vehicles weren't an issue this game. He'd also booby trapped some of the terrain pieces; it didn't really affect the flow of the game, but I think it netted a space marine or two. 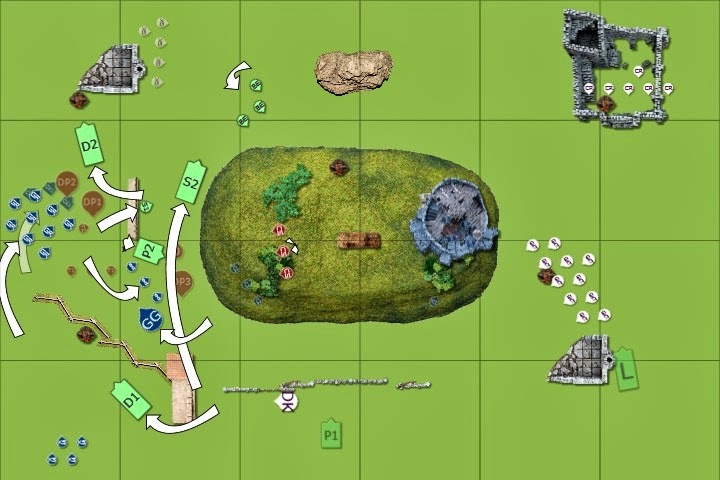 I really felt uncomfortable playing the pathfinders, for fluff reasons and because they are so darn squishy, especially compared to the rest of my force. I took them to give them a chance and see what happened. The force was pretty much just a TAC army with elements that I was experimenting with, just to see how they'd perform. If the XV-8 names are unclear, I used this Guide for naming them. Our opponents were Dark angels and Grey Knights. Again, I didn't get copies of their lists (they wrote them out 10 min before the game started) but here is the general idea. Overall a fairly TAC list, trading fast bikes for drop pods and termies. Not much in the way of anti-tank except for the fighter, power fists and chainfists, but perhaps vehicles are less of an issue in this area than I thought. He usually doesnt play his Grey Knights because he feels like a jerk when he does, but he gave it a go anyways and I'm glad he did. I've never played GK so this was a great learning opportunity for me. Also light on the anti-tank, aside from the Dreadknight, Vindicare and Psybolts. Warlord Traits: Nobody else's mattered, but I rolled Through Boldness, Victory on the Tau table. Perfect! Night Fight: completely forgot, though I don't think it really would have come into play. The large terrain piece in the middle was area terrain, just about everything else was either ruins or razorwire. Scout: Pathfinders, but I did not use the scout move. The Dreadknight shunted forward and the two Drop Pods with Tac marines in them landed in front of the Kroot. The DA command squad rolled badly for its difficult terrain test and hardly moved forward. The vindicare assassin failed to penetrate Longstrike, the Dreadknight wiped out half of the kroot squad in front of him, and the DA tacticals targeted the kroot nearest them. Bad rolls, plus some lucky cover saves by the Nid Kid kept losses to a minimal. A lucky plasma cannon blast from the DA command squad killed a single kroot and immobilized on of my piranhas. Coteaz and his retinue wiped out my pathfinders with re-rolling misses and ignores cover fire, landing our opponents First Blood. Realizing I didn't have the firepower to deal with the Dreadknight yet, I decided to try and lure it away. I moved Longstrike forward and prepared the Skyray and Devilfish to make a break for the relative safety of the left flank. The piranhas both dropped their drones and the mobile one repositioned to help out against the DA armour. SMS fire wounded the Vindicare once and killed a few of Coteaz's retinue. The Kroot fired on the Tacticals and killed a plasma cannon with a rending precision shot. My detached drones attempted a charge on the Dreadknight (who knows? they might survive a round of combat...) but an Overwatch casualty caused one to flee and the other pair failed their charge roll. The Dreadknight couldn't resist the Longstrike bait and positioned himself to charge. 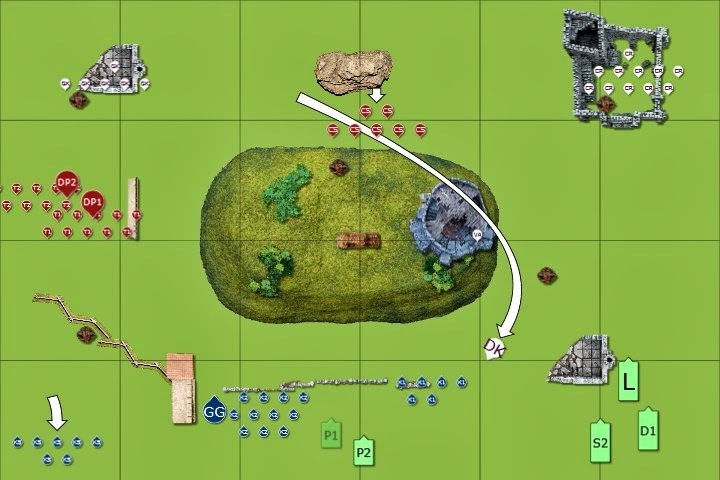 The DA command squad again rolled a 1 for movement. The large blob of Grey Knight terminators dropped near the objective between us and the DA flier came on as well! They had almost their entire fighting strength on the board and we had barely half! The Grey Knight terminators and Coteaz continued to punish any Kroot that happened to be in range. The vindicare landed a "Shaken" result on my Skyray but the Dpod turned the shot. The tacticals continued firing but the kroot had a few shapers and lots of numbers to take it. The DA flier, for some reason, targetted the Greater Gnarloc but only managed a single wound thanks to poor rolling. It became apparent that this DA player was having a bad rolling day, and I intended to make full use of that. The Dreadknight assaulted, penetrated, and exploded Longstrike. The explosion caused a wound on the Dreadkight that he failed to save! Huzzah! My Sunforge-D team and second Devilfish arrived from reserves, along with a couple of the Kroot reserves. The kroot and their newly arrived reinforcements continued adding pressure to the DA Tacticals and the hidden kroot unit appears on the building with the vindicare. My piranha moved to try and be a nuisance while the Devilfishes just moved to stay alive. I dropped the Sunforge-D's near the DA command squad that hadn't quite got into cover yet, and did not scatter. Phew! The kroot kept shooting tacticals and my Dfish took some pot shots at Coteaz's retinue before going out of range, killing a couple. The Greater Gnarloc snap fired at the fighter, landing nothing. The Skyray landed two ML hits on the flier. I used one hit to guide a missile and the other to boost the Skyray's BS. Even with evade, the flier exploded on the spot. Unfortunately, the Skyray had to hold still to do this, keeping it in range of assault by the Dreadknight next turn, but I felt it was worth it. The Sunforge-D's killed one of the DA command squad, and the closest model happened to be the Champion. My piranha failed his penetration roll (of course) on a drop pod. The Kroot kill the vindicare in assault and I repositioned my drones to screen the right-hand devilfish. The Sunforge-D's jumped the full 12" away from the DA command squad but I kept them in the open to avoid an unlucky dangerous terrain test. The Dreadnought dropped in our lines, the DA command squad finally moved forward a decent distance, and the Dreadknight positioned itself to charge the Skyray. Coteaz's retinue exacted vengeance on the sneaky kroot and killed 6 of them (no cover, ouch!) while the combined fire of the Grey Knights and the Dreadnought reduced the Sunforge-D's to a single suit with a single wound. The Grey Knight terminators, with nothing else to shoot at, killed off the pair of drones screening my Devilfish from assault. The DA command squad was very far from the nearest Kroot, but he gave the charge a try anyways and failed. Overwatch fire did nothing. The Dreadknight's Gatling had no effect on the Skyray's rear armour and he failed his charge distance too! My commander and my ally's gnarloc riders both failed to arrive, but he got his other units and I got my Stealth team. I had them walk on direcly behind the Tacticals. Both squads were now about 5-6 models each. My lone Sunforge-D and piranha got ready to shoot the Dreadnought and my other vehicles all repositioned away from the Dreadknight moving through our deployment zone (except for the stranded immobilized piranha of course). The kroot all got ready to assault with what units they had and the Greater Gnarloc tried to shoot the nearest drop pod. My Stealth team claimed 3 space marines and the kroot killed one or two before charging one of the squads. My piranha missed and my Sunforge-D managed a "Stunned" result (I think we said "Shaken" forgetting the AP1, so he moved the next turn. No big deal). My Sunforge-D and Stealths repositioned while the Kroot charged one of the Tactical squads. I wasn't paying very much attention to how the assaults were going, but it was becoming obvious that even without the support of my Stealths, the Kroot would overrun the DA Tacticals with sheer weight of numbers... eventually. The Dreadknight moved to charge the immobilized piranha, but it was still a decent charge range. None of the other Grey Knight units moved since all three were holding objectives. The DA command squad continued moving forward. The Dreadknight's gatling failed to even glance the piranha, the DA command squad shot up some Kroot, and the Grey Knights plus Drop Pods targetted the Stealth suits. I only lost the two gun drones thanks to some good armour saves. The Kroot and Tacticals combat continued. I believe this turn ended with the Kroot winning but the DA refusing to run. Also, the DA command squad tried to get to grips with the nearby kroot, failing their charge distance and losing the Veteran Terminator to Overwatch fire! Alright, this was my chance. I'd been itching to use my commander's unit all game, and I finally had them. My ally's gnarloc riders came on as well. I continued shuffling my vehicles and preparing to fire. I dropped my commander just inside 12" range of the DA command squad thanks to my Warlord Trait. The Kroot could smell blood and were getting ready to finish off the Tacticals. My Skyray landed a ML hit on the DA command squad and I used this to boost my Burning Eye-D's BS. My Sunforge-D finally succeeded in wrecking the Dreadnought (again, I think we forgot it should have been "Explodes" from the AP1) and the Piranha wrecked the Dreadnought's drop pod for good measure. The Stealths fired on the entrenched Grey Knights but did not kill any. The Burning Eye-D team opened up on the DA command squad. Increased BS and Re-rolling misses, plus Ignores Cover is brutal. We'd been taking re-roll misses and Ignores Cover all game and it was time for payback! Of the 12 plasma rifle shots, I landed 10 wounds. Thanks to Character shenanigans he only lost his Plasma Cannon terminator but both the Chaplain and Ezekiel were reduced to a single wound each. 5 out of 10 wounds against a 4+ invulnerable (Chaplain was closest) and 5+ FNP was better than I was expecting. My immobilized piranha took a pot shot at the DA command squad but missed. I jumped my suits around and started planning for the endgame. The Kroots managed to cause a Tactical squad to retreat, but could not catch them. The Dreadknight ignored my immobilized Piranha and went for my bigger vehicles instead. 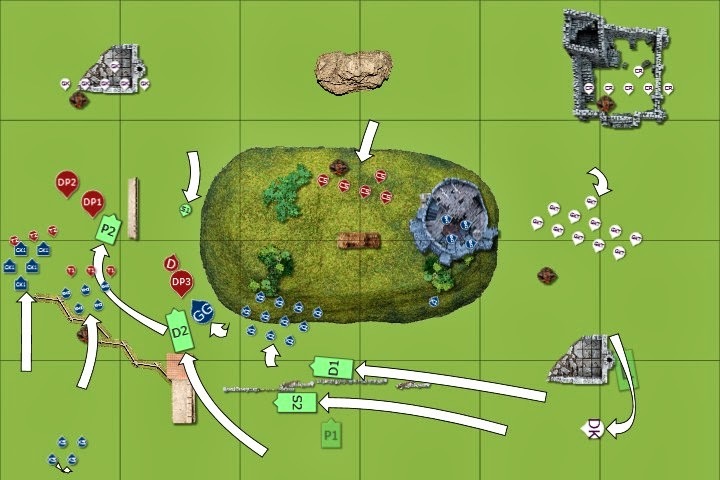 The DA command squad soldiered on, but the wind was knocked out of their sails from my shooting attack before. They were approaching the left edge of the area terrain. The Grey Knights tried to vacate their cover to get in charge range of my Burning Eye-D's. A lone veteran sergeant prepared to charge my Sunforge-D while his comrades tried to hold off the Kroot advance. Combined shooting from Coteaz's retinue and the Grey Knights killed 2 gun drones, a shield drone, and one of my Burning Eye-D's, but I passed my leadership test. The DA command squad do not shoot in order to ensure getting into CC. The Dreadknight failed his charge distance again! He only needed 5" or so too! The DA command squad reached combat and killed off the Kroot. The Grey Knights attempted a charge on my Burning Eye-D's, but a single Overwatch kill brought them less than a 1/4" short. I moved my devilfishes, that I'd positioned last turn, 6" and unloaded both sets of Firewarriors on the two left Objectives. The remaining Kroot centaurs prepared to charge the lone Veteran Sergeant, locked in combat with my Sunforge-D. The gnarloc riders prepared to run down the other squad of 3. 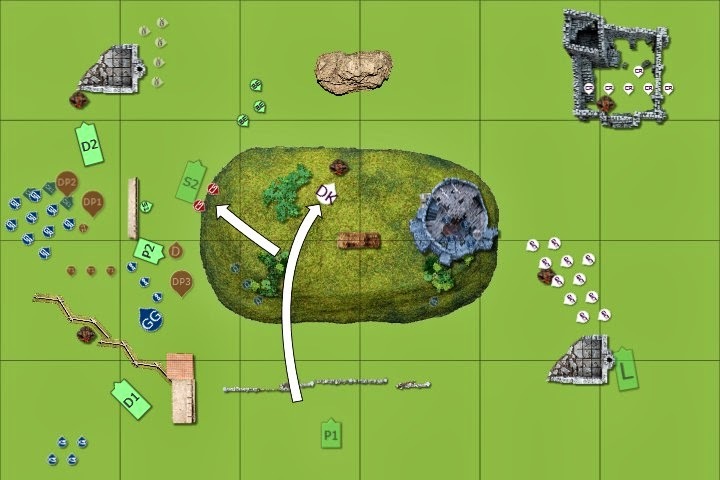 My Skyray, as the only other scoring unit left to our team, moved flat out to make a dash for the central objective should the game continue into 6. The top Firewarrior squad fired on the Grey Knights in the ruins, killing one. The Burning Eye-D's killed all but one of the Grey Knights and the lone survivor fled the table. My Stealths had their LOS blocked by the Skyray, but one suit could still draw LOS on one Terminator (Apothecary). He failed his armour save and the Apothecary died! :) My immobilized Piranha, angry at being ignored, managed a second wound on the Dreadknight standing right in front of him. The Kroot charged, killing the remaining Tacticals. 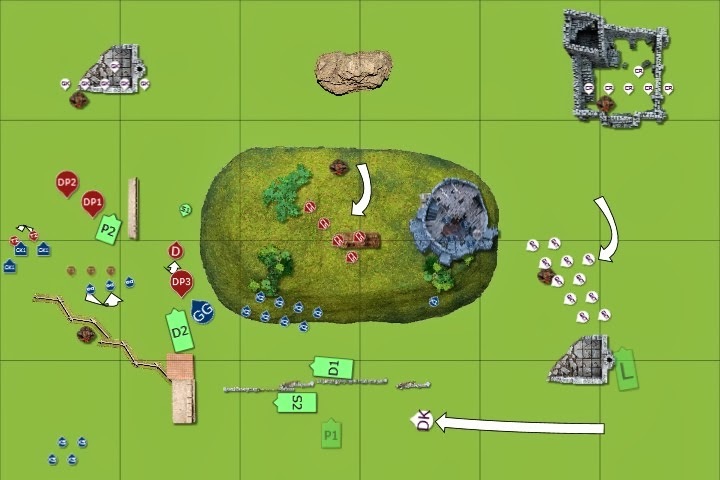 The Centaurs failed to kill the Veteran Sergeant, who ignored them and tried to take vengeance on my Sunforge-D. My XV-8 passed his armour save and kicked the Sergeant in the face, killing him. The Gnarloc Riders multi-charged both drop pods, exploding them with Meltabombs and killing one of their own. I rolled a 6, and play continued into turn 6. Desperate to gain some points on us, the Dreadknight jumped and ran for the central objective. The DA command squad prepared to assault the nearby Skyray. With little left to shoot, Coteaz's retinue fired on the Burning Eye-D's again with long range Heavy Bolters, Plasma Guns, and Lascannons. My commander took another wound from the plasma, the shield drone saved both Lascannon hits, and my commander saved the bolter shots; so no casualties. The DA command squad charged in, the Chainfisted terminator exploded the Skyray killing one of my Stealth suits and himself in the process! Man, this guy was having the worst luck with armour saves. It was all or nothing now. All Kroot shooting was directed at the two DA characters (Ezekiel and Chaplain) managing to bring down Ezekiel and gaining Slay the Warlord for us. My Burning Eye-D's targetted the Dreadknight and killed it off too. For good measure, my Stealth suits finished off the Chaplain. At this point, nothing else was in range, and both armies were firmly established on their table halves. A very hard fought battle. Had the game ended on turn 5 it would have been 4-3 Imperium, and had it gone on to turn 7 the Grey Knight player could have stretched his termies into my deployment zone and got Linebreaker for a 6-5 Imperial victory. Though I think everyone forgot about linebreaker except for me; I had to bring it up when we were totalling the points. I forgot to use my ATS and character precision shooting completely! Had I remembered, I could have focused fire on particular Terminator models, but I think it turned out fine anyways since his characters were the closest models. Pathfinders. They gave up first blood and possibly cost us the victory. This was mostly my fault for not knowing what Coteaz was capable of and bad deployment. Initially forgot to use the Shas'O as a wound sink against shooting; it cost me one of my Burning Eyes and a gun drone. Forgot to use my piranha in the later stages of the game, probably would have made no difference anyways though. Didn't get enough distance on the Dreadknight initially. The only reason he didn't catch my Skyray and Devilfish was because of bad charge rolls 3 times in a row. Mixed up my flatout move, blocking LOS before shooting. Derp! Wasting fire on Coteaz's retinue. I killed about half of them, but since I was vacating that side of the board I probably should have focused elsewhere. Redeployment. Booking it to the left hand side of the board made the most expensive Grey Knight unit pretty much useless for the rest of the game and evened the odds for us. Skyray. I loved it. Performed exactly like I'd hoped, the DPod jink kept it ready to fire when the Fighter came on, and it almost made it to turn 6 for an objective grab. Longstrike. He died quickly, but he attracted all the attention into the corner and away from my fish/skyray. Just like I'd hoped. I never expected him to survive. The Commander + Crisis Team. This unit turned the entire game. Wiping out the Grey Knights on the objective, and the Dreadknight on the other, plus weakening the DA command squad substantially really made a game of it. And that was with me completely forgetting to use ATS! Sunforge team. Lasted much longer than expected, killing a dreadnought, a DA champion, and a Veteran DA Sergeant in CC. Kudos to that guy. Failed armour saves. My opponents failed their fair share of armour saves and I didn't feel like we were having a really hard time chipping away at their numbers. When the Dreadnight exploded Longstrikes HH, he took an unsaved wound from the blast. The joke was that Longstrike himself, flew from the exploded tank onto the exposed terminator and started throttling him! Hilarious. However, Longstrike doesn't go down that easy and all three of the Dreadknight's failed charges were attributed to Longstrike strangling the terminator, who could not reach him because of his harness. He was given MVP for the game, and the grey knight player was convinced Longstrike survived, harassing the Dreadknight to the end. The Tau firewarriors cautiously approached the Dreadknight's smoking wreckage. A soot blackened figure in white armour lay on top. Riddled with holes and clearly concussed multiple times, Longstrike looked up. He released one of his hands from the dead terminator's gorget and waved. Hope you enjoy reading this! If there's something in particular that you would have done different, by all means tell me! Another persepective makes everyone better. Also, let me know if this Batrep format is difficult to read so the next one can be better. Yeah, Battle Chronicler isn't very forgiving and I am not very experienced using it. So sometimes I'd realized I got something wrong two turns ago, but I cannot go back and change it. The next one will be better. Nice battle report. Codex Tau has finally got me interested in playing a game in nearly a year! I'm particularly interested in Tau Commanders with twin-missile or twin-plasma combinations, combined with escorting units. Kroot seem more a more irrelevant to me... which is sad considering.